Author(s) McDonald, Bryan L.; McDonald, Bryan L.
There is a widespread assumption that the American food system after World War II was transformed-toward an increasingly industrialized production of crops, more processed foods, and diets higher in fat, sugar, and calories-as part of a unified system. 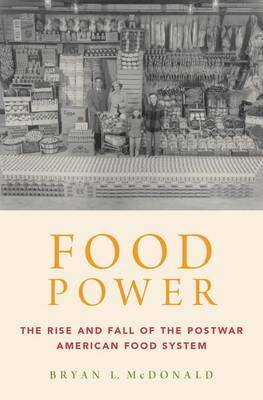 In this book, Bryan McDonald brings together the history of food, agriculture, and foreign policy to explore how food was deployed in the first decades of the Cold War to promote American national security and national interests, a concept referred to as food power. In the postwar years, Americans struggled to understand how an unprecedented abundance of food could be used to best advance U.S. goals and values. Was food a weapon, a commodity to be valued and exchanged through markets, or a substance to be provided to those in need? McDonald traces different visions of food power and shows how food formed an essential part of America's postwar modernization strategy and its vision of what it meant to be a stable, secure, and technologically advanced nation. Policymakers and experts helped build a new food system based around American agricultural surpluses that stabilized prices and food availability. This system averted a global-scale food crisis for almost three decades. The end of this food system in the early 1970s ushered in a much more precarious period in global food relations. By the late twentieth century, food politics had become a battleground in which the interests of security and foreign policy experts, farmers, businesses, and politicians contended with a growing social movement whose adherents worried about the role of food in contributing to conflict and inequality.Food Power argues that the ways postwar American policymakers and experts politically linked people and places around the world through food illuminates both America's role in the world during the mid-twentieth century and sheds light on contemporary food problems.